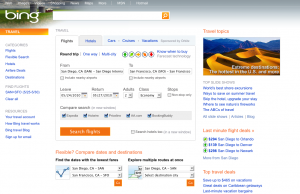 Today’s Essentials are some tips that can help you when you’re booking a trip. These are some of my favorite ways to save money or get the best bang for my buck. This is my go-to way to book hotel rooms. Which is funny because you’d think that being the control freak I am that this process would drive me nuts. But give me the opportunity to stay in a $300 hotel for half that price and I lose a little bit of my obsessive control tendencies. For anyone who doesn’t know how this works, Priceline allows you to bid on the elements of a trip–hotel, airfare, and rental car. For hotel, you choose your city, your dates, the areas within the city that you would be ok with and the star rating for the hotel you want to bid on. Then you put in your bid. What you don’t get to do is choose the actual hotel. You take a bit of a gamble that you’ll end up with something you’re ok with–you have to give your credit card information up front, and if your bid is accepted by a hotel, the room is prepaid and THEN you find out the hotel. We’ve used this probably 6 or 7 times over the last few years (we’ve only done airfare and rental car once–the airfare is just a little too much of a leap of faith for me, but if you’re open to not knowing your exact itinerary until after purchase, you can save a significant amount of money). With only one exception, we’ve always ended up in AWESOME hotels–gorgeous, lush, fantastic hotels that are way out of our price range normally. The one exception was a down and dirty trip we needed to make on the super super cheap. That trip we did the 3 star option and ended up with a budget hotel, but at like, $20 a night. Worth it. We’ve used it for trips to Chicago, San Diego (when we lived in New York), San Diego (when we wanted a quick “get-away” trip in town), Santa Cruz, and now San Francisco. 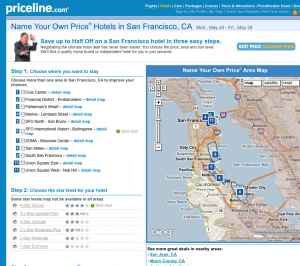 My biggest tip if you use this option–in the “regular” part of Priceline, look at the hotels in the area you’re requesting at the star level you will request before you purchase and see what hotels pop up. This will let you two things–1) if you’d be ok with what might come up and 2) a price point to base your bidding off of. So, if you know you’re going to request the Financial District of San Francisco at 4 stars, and you see that the hotels are ranging from $250-$450 a night, you can set your bid based off that. I generally look at the lowest priced hotel, see if I’d be ok with that one, and then bid 1/2 the price of that hotel. Most times it’s worked for me, though sometimes it will kick back until I get to closer to 40% off. This is a new thing I found this past week. 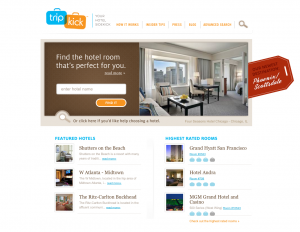 Tripkick lets you look into what the actual rooms at a hotel may be like. So you can look on there and see that the rooms ending in 17-47 on floors 1-4 at your hotel are really noisy, but they are more roomy, and have been renovated, but the rooms ending in 03-23 on floors 5-9 are quiet and have great bathrooms. There’s some other general information about the hotel, but the real key is the info about rooms and floors. It’s not a huge database (and mostly seems to be slightly more upscale hotels at this point), but the information is a handy little cheat sheet if you find yourself staying at a nice hotel and really want the inside info on what you might be getting, or want to know what rooms/floors to request. Farecast (which looks like it has been absorbed into Bing) is a handy little thing if you’re looking to book a flight for the future. You can input your travel criteria (from where to where, when, etc) and Farecast will do it’s magic and let you know whether fares are going to going to go up (buy now), go down (wait) or stay the same (you’ve got some time to decide). Apparently they’re accurate about 75% of the time, which is enough to be handy if you know you’re going to take a trip in the future and don’t know whether to buck up and pay now or wait until a little closer to the trip. These are some great tips. I love the idea behind forecast … because we normally wind up booking our flights through the same airline (hello miles), but it’d be nice to know when their fares rise and fall!